Between April 1972 and May 1975 Stephen Bierstock was employed with the a Los Angeles personal injury defense firm as a trial attorney during which time he gained extensive experience as lead defense attorney in Superior Court jury trials. Stephen joined Mullen & Filippi in May 1975, working in San Francisco for a year before transferring to the San Jose office in May 1976. 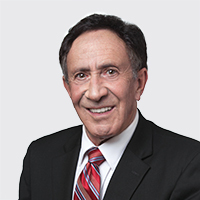 He advanced to the position of Senior Partner 1981 and managed the Firm's San Jose office from 1981 until 1989. Stephen then transferred to the Firm's Sacramento office where he served on the Firm’s Management Committee from 1998 through 2002. During his years with Mullen & Filippi in addition to defending workers’ compensation claims on behalf of insurance carriers and self-insured employers, Stephen also practices in the areas of third party claims subrogation and representing employers in connection with serious & wilful misconduct and unlawful discrimination pursuant to Labor Code §132a claims. Stephan earned his Bachelor of Arts degree from Hillsdale College in Hillsdale, Michigan in 1965 majoring in English Literature with a minor in History. At that time he was a Canadian citizen. Stephan permanently moved to California in 1965 and applied for United States citizenship. Stephan attended San Fernando Valley School of Law, an accredited four year law school in Van Nuys. Notwithstanding having passed the California Bar Examination following his graduation, in 1972 American citizenship was required in order to become a member of the California State Bar. Accordingly, upon becoming a citizen, Stephen was sworn in to the State Bar in March of 1972. In 1992 I was hired by a prominent Los Angeles personal injury defense attorney, and very soon thereafter I was defending liability insurance carriers in Superior Court trials throughout the greater Los Angeles area. While living in Southern California I often visited with family members in northern California and decided that northern California lifestyle was more suited to my personality. I purchased a home on the peninsula in Los Altos and accepted a position with Mullen & Filippi. I was initially hired as a subrogation attorney but quickly branched into all areas of workers’ compensation defense practice. I view my decision to join Mullen & Filippi as a life changing decision which I never regretted for one moment. Growing up in a rural community in Ontario, Canada my greatest pleasures were exploring the woods and discovering and excavating indian villages. Naturally, I grew up wanting to be an archaeologist. I also enjoyed engaging in heated debates with my friends and acquaintances, many of whom told me that I would make a good lawyer. I followed their advice and have no regrets in so doing. My favorite pastimes are spending time with my family and friends, playing guitar, and collecting and restoring antiques. In my law practice, my greatest reward is receiving the appreciation of the clients with whom I work.